Ben Ryan and the Fiji 7s players have been given $30,000 each and presented honorary medals by President Jioji Konrote for their Gold Medal win at the 2016 Rio Olympics. President Konrote as the Chancellor of the Order presented the Companion of the Order of Fiji medal to Fiji 7s coach Ben Ryan. Companion of the Order of Fiji medal is the highest honorary medal that is given by the Order of Fiji. The Fiji 7s players including Savenaca Rawaca received the Officer of the Order of Fiji medals with their $30,000 cash prize. Team Manager Ropate Kauvesi, Trainer Nacanieli Cawanibuka and Team Physio William Koong also received $30,000 each with the Officer of the Order of Fiji medal. Semi Kunatani, Leone Nakarawa and Team Manager Ropate Kauvesi were not present to receive their medal and the cash prize. They will arrive in the country later in the week. Earlier this afternoon, the Gold medal winning Fiji 7s team received the biggest cheer that the ANZ Stadium has ever heard when they made their opening victory procession around the stadium. People travelled from as far as Koro, Naitasiri, Wainibuka and even Vanua Levu to join in the celebrations today. Most of those who were part of the celebrations at Prince Charles Park yesterday have also travelled to Suva for the celebration at the ANZ Stadium. The ANZ Stadium is packed and gates to the main ground have been opened for people who were marching with the team. The traditional welcome ceremony was done by the people of Nakelo and the crowd erupted when Ben Ryan finished his bowl of kava. 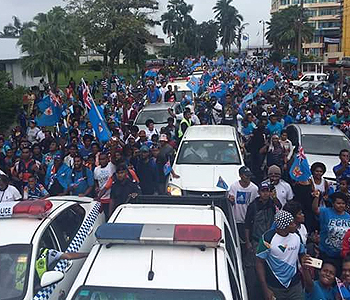 Thousands had joined the celebration march from Suva Flea Market to the ANZ Stadium this morning.